I love ginger. It is so good for so many things from recipes to ailments. Ginger is great in tea (hot or cold), great in recipes (think Chinese dishes or gingerbread cookies) and can help with nausea and other ailments. 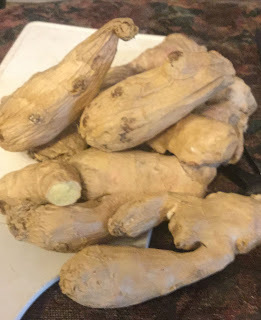 It is good to have some on hand always so one way that I do so in our household is to dry the ginger in my dehydrator. It is super easy to do and makes it where you can have ginger on hand all year long. To dehydrate ginger, take fresh ginger and using a vegetable peeler, peel the ginger, then slice into thin slices. Lay the slices on your dehydrator trays. Fresh ginger all sliced up. Turn on your dehydrator to 135 degrees and dehydrate for 4-6 hours. 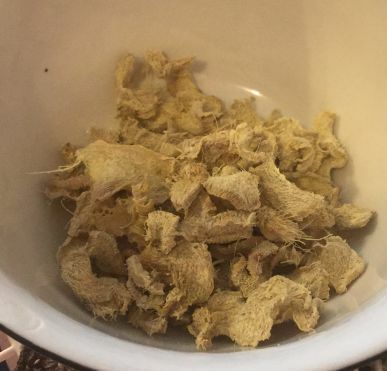 You can store the dried ginger in a canning jar or you can turn it into ginger powder and store in a baggie. It may sound weird but I also dehydrate Banana Peels and Coffee Grounds. Click to find out why! 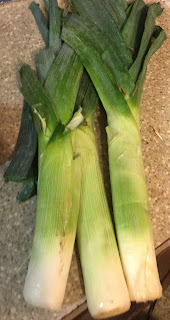 During the winter time, I love making huge pots of leek and potato soup but it is hard to find leeks readily available during the winter months. I prepare for this by growing our own leeks and dehydrating them in the summer time. I try to dehydrate enough to last all year long. Leeks have a mild onion-like taste to them and compliment a lot of different dishes. I mainly use them in soups, stews, and casseroles. You can use them in place of an onion in any recipe you see fit. They dehydrate easily and can be rehydrated quite easily. To dehydrate a leek, first cut off the ends of the leeks, including the green ends. Wash well. Slice the leeks about 1/8"-1/4" thick. Once they are all cut up, run the slices under water or soak for about 5 minutes. You soak them to get all the dirt off of them. Lay the leek pieces on your dehydrator tray and dehydrate at 125 degrees for about 8-10 hours. I generally just turn on my dehydrator before I go to bed and they are ready the next morning. I also like to dehydrate jicama & purple cabbage!